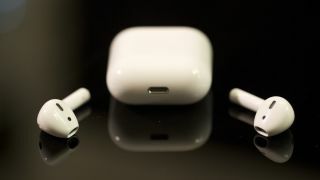 Apple has filed a patent for the next iteration of the AirPods that could mean the little wireless earphones become a fitness tracker in and of themselves. The patent shows that the AirPods will contain biometric sensors. While biometric sensors in headphones aren’t a new proposition- the Jabra Elite Sport already have this - it is exciting to see Apple is working on this technology. According to the patent found by Patently Apple, the sensors aren’t just limited to simple heart-rate monitors either. It appears there are plans for EKG sensors, that monitor the electrical activity of your heart, impedance cardiography sensors, and more. Impedance cardiography is the technique of sensing the electrical conductivity of the thorax to ascertain a range of measurements about your circulatory system including stroke volume (the amount of blood your heart is pumping), and heart rate (how often your blood is pumping) to gauge your cardiac output (the total amount of blood your heart is pumping). The reason that all of that science is important is that you can very accurately figure out not only your heart health, but also how much oxygen your body is using during exercise, and therefore how fit you are. It’s a major step up from the simple heart rate readings you currently get from most fitness trackers. What’s more, the patent mentions a galvanic skin response sensor, which measures the electrical resistance of the skin to ascertain the emotional stress levels of the wearer. They are typically used in lie-detector tests, but don’t worry, it’s more likely that the sensor in this setting would be used to monitor your emotional state. Another exciting line from the patent is: “In some embodiments, the housing of the earbud can be symmetric so that the earbud can be worn interchangeably in either a left or a right ear of a user.” So we could be seeing the end of trying to figure out which bud goes in which ear. As this is just a patent there’s no guarantee that we’ll see this technology in real life but, as always, as soon as we know more we’ll let you know.